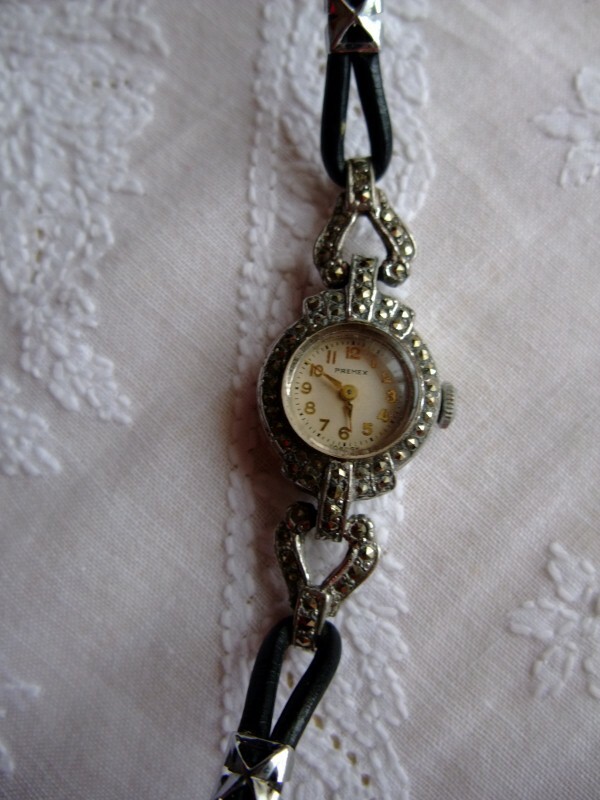 I was just looking for a pair of earrings when I came across my Nan's watch in my jewellery box. Seeing the little marcasite watch & leather strap reminded me of this wonderful page from one of my 1930s Liberty of London catalogues - here we have a selection of pearls and diamonds set in platinum - wow! Have experimented with scanning & photographing the page but sadly the reproduction quality of both is a bit fuzzy. Not fuzzy enough to dim the diamonds, though! My Nan's little watch below, worn with love & pride on my wedding day. And the diamond & platinum version in close up - dream on Karen! Reckon would need to add a few zeros on that 1930s price tag of £25.00.